For several years – especially in the Northern Europe countries – systems, which simultaneously produce electric power and district heating have been successfully marketed and set in operation. These plants are generally called CHP (Combined Heat and Power) plants. Because of the escalating cost of fossil fuels and an increasing awareness of global warming, these systems are often fuelled by MSW (Municipal Solid Waste) or various biomass waste materials. These fuels are strongly politically recommended and the use of non fossil fuel based CHP plants is anticipated to increase drastically in the near future. The technology is well proven and numerous reference plants are in operation today but an important restriction against more widespread implementation of CHP is the unavailability of district heating interest in many – especially warmer – regions, where the infrastructure for this is either not available or where the centralized production of heat for domestic heating is not an important issue. However, the heat produced by the combustion system may be used for other purposes – specifically for the production of refrigeration or potable water. We will review the latter application – CWP (Combined Water and Power). In the CHP plants based on combustion of waste material typically electric power is produced by the medium pressure steam turbo generators with an efficiency of about 24% and – by using condensation around 100oC – district heating water is produced at 90oC (and returned from the grid at 40oC) with and efficiency of about 65%. These are actually optimal conditions for the ATLAS-DANMARK freshwater generator AFGU (Atlas Freshwater Generating Unit) – which in the early 1950’s were developed for exactly this purpose and based on cooling water from ships diesel engines. Later, the AFGU also found use in land-based systems – especially in the Middle East – and also on offshore accommodation platforms and cruise vessels. By combining the well-proven application of the waste fuelled steam power cycle and the ATLAS-DANMARK low temperature multistage evaporation desalination a very interesting concept emerges. Consider a furnace for the combustion of e.g. 3000 kg/h MSW or 2600 kg/h woodchips (with a typical moisture content of 40%) or a combination of those fuels. 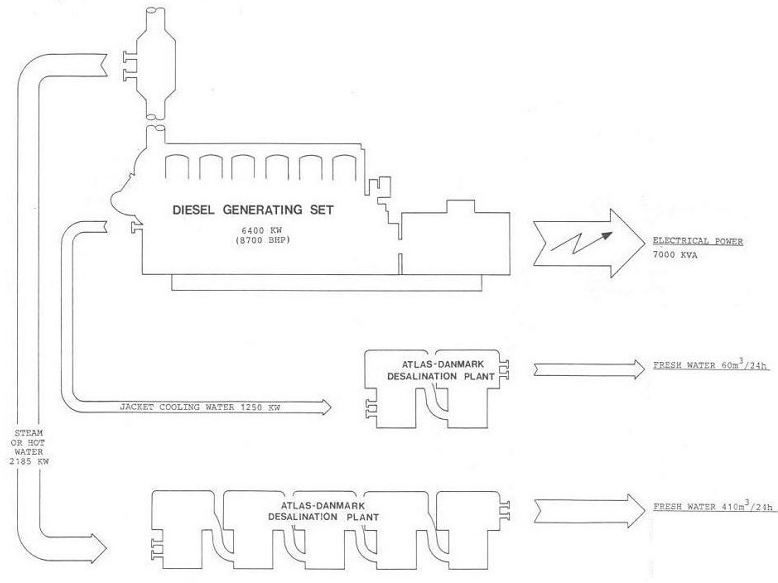 In an associated state of the art medium pressure (40 – 60 atmospheres) boiler, steam necessary for operating a 1800 kW turbo generator may be produced together with 4900 kW condenser cooling water. This amount of heat is adequate for producing 900 m3/day of potable water from saline or brackish water using an ATLAS-DANMARK multistage AFGU 6s150 desalination plant. Therefore, a system like this would be able to pro´vide both power and water for a small community of – say – 2000 households, and at the same time threat the MSW from the community in an environmental friendly way.